Yesterday I came across this site: http://caloriecount.about.com. I don't think I should lose a lot of weight, BUT! Those 3-4 extra kilograms follow me way to much lately. I think I just want to be careful about what I eat. 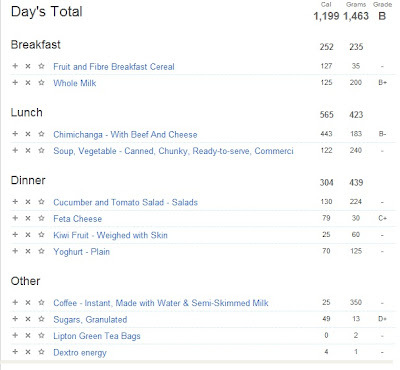 My goal is to stay under 1600 calories every day. And possibly to work out at least a bit. A little bit. :) Yesterday I got a B!